News from James Randi: Court Denies Geller's "Petition for Contempt"
Exclusive! Alien Spaceships Attacked First World Skeptics Congress! Recent news and sources of interest, with brief summaries and a rating of the content: 1 = Pro-skeptical; 2 = Leaning skeptical; 3 = Neutral, presenting sides equally; 4 = Leaning paranormal or pseudoscience; 5 = Pro-paranormal or pseudoscience. Several months ago, at least one "psychic" posted messages to newsgroups, including sci.skeptic, alt.paranormal, and alt.paranet.psi that I was under contempt of court charges brought by Uri Geller. Not surprisingly, the psychic was unable to forecast that those "charges" were rejected by Judge Harris of the United States District Court for the District of Columbia. I also note that the psychic did not update his postings, advising readers of Geller's loss. In the Petition for Contempt, Geller asked the court to fine and jail me (he used the expression "incarcerate, because that's lawyer talk), and award Geller damages. In response to the Contempt Petition, we noted that Geller's Petition had no basis in fact or in law; that in Geller's initial deposition -- unprotected by an protective order -- he himself admitted lack of financial resources under oath. Further, the protective order itself that was signed by Judge Harris back in 1993 was drafted by Geller's lawyer was directed solely at CSICOP, not me. Interestingly, it was that same lawyer who filed the Contempt Petition. In a one-line Order, Judge Harris denied Geller's latest abuse of judicial processes and attempt to limit free speech, for the reasons stated in my Opposition to the Petition. 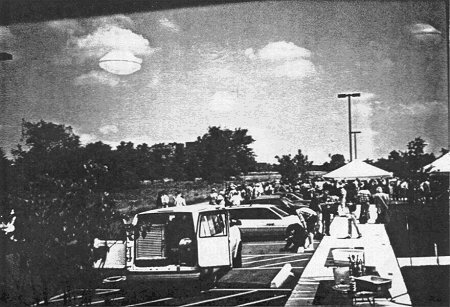 A Springfield, Illinois, skeptics' group newsletter has revealed that three alien spaceships abducted 13 attendees of the First World Skeptics Congress in Amherst, New York, last year. A cover-up ensued until this photo was released. More later. Source: Winkandanod News Service.